You can easily grow your own lettuce in a garden or a container. 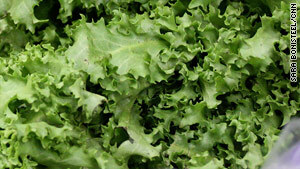 (CNN) -- Despite the recent recall of potentially contaminated Romaine, lettuce lovers don't have to nix key ingredients from their BLTs or face lifeless, leafless salads -- they just need to go to seed. Food-borne illness has been tied to E. coli 0145 found in commercially-grown lettuce sold to wholesalers, food service outlets and some in-store salad bars and delis. Not only can at-home growers skip this risk -- they'll also save money, enjoy a nearly endless variety of organic and heirloom options and have fresh salads at their fingertips all year around -- even without an outdoor garden. Lettuce grows in several major formats: loose leaf (like Lolla Rossa and Black Seeded Simpson), crisphead (Iceberg and Great Lakes), butterhead (Bibb and Buttercrunch), Cos (also called Romaine) and stem (mostly used in Chinese cooking). For small container gardens and windowboxes, loose leaf is a solid bet, as it grows quickly and doesn't need to establish deep roots. Most hardware, garden and variety stores carry a range of popular seed varieties -- often for $1 or less -- but adventurous gardeners may wish to explore colorful, flavor-packed heirloom and certified organic single-seed packets and blends from online retailers. The Seed Savers Exchange and D. Landreth stock dozens, from blazing Mascara to deep, dark Red Velvet. Just about any will do, from store bought terracotta pots and plastic window boxes to take-out containers, foil pie pans, halved two-liter bottles and emptied-out plastic clamshells from the supermarket. The vessel just needs to be food-safe, several inches deep and perforated at the bottom to allow drainage. Starting head lettuce in peat pots inside containers allows the option for transplant into a larger garden space -- or even sharing the bounty with friends. If it's going into the food, it's going into you. If possible, opt for chemical-free or organic potting soil -- increasingly available at major hardware stores and home centers. Lightly shaded outdoor areas are ideal, as tender young leaves are susceptible to burning in bright sunlight, but windowboxes and kitchen counters can also produce surprisingly robust crops. If natural light isn't available, cool white bulbs and fluorescent lights can successfully stimulate vegetative growth. The seedlings need about 12 hours of light a day, and gardeners may need to adjust the distance from bulb to soil to figure out what works best in their home. You will also need a spray bottle and some plastic wrap. Place at least 2 inches of moist, lightly-packed potting soil into a container with drainage holes. Sprinkle a sparse layer of seeds on top of the soil and follow that with a very light dusting of soil. Mist the soil with a few pumps from a water bottle, lightly cover the container with plastic wrap and place in a warm, bright spot. The seedlings should germinate in about five days. Once they have, remove the plastic wrap and keep the container in the light for around 12 hours a day. Keep the soil moist with the spray bottle or gentle watering from a can or cup. Make sure the soil is draining and not pooling at the bottom of the container. Most crops will be ready to harvest and enjoy within three to four weeks for leaf varieties, and longer for more robust heads. Just snip leaves directly into a colander, rinse and enjoy the fruits -- and vegetables -- of your labor.